Gman: Welcome to our first installment of our new weekly series, “Poopin’ Around with Steve Spurrier”. We’re happy to have Coach Spurrier on this week to tell us who and what were “poopin’ around” during Saturday’s 38-20 victory over Arkansas. Coach, thanks for joining us, can you give us your general thoughts on the game? Gman: Any individuals’ poopin’ around stand out to you? 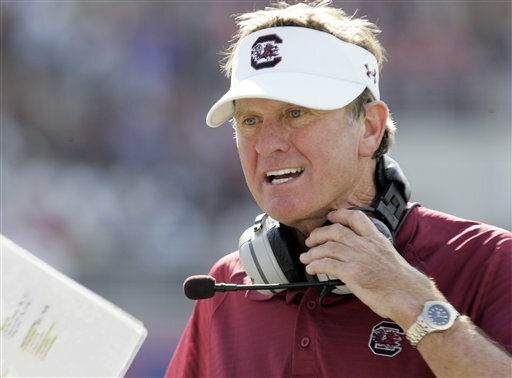 Spurrier: Connor played well most of the game, but he probably pooped around more than anybody in the fourth quarter. We coulda scored more points but he really pooped around on that interception in the end zone. Then again, Busta could’ve run a more determined route, so you might have to accuse him of a little poopin’ too. Anyway, it is what it is. Gman: Coach, how about the defensive side of the ball? Spurrier: Not a lot of poopin’ around after the first half. Jimmy (Legree) pooped around quite a bit out there early, but we made some anti-poopin’ around adjustments at the half that seemed to work. You’ll have to ask Coach Ward about those. Gman: How about Jadeveon Clowney? Spurrier: Definitely no poopin’ around from Doo Doo. He probably caused some poopin’, but I didn’t see any specific plays where he was poopin’ around. Doo Doo usually is one guy we can count on to not poop around. Gman: Can you comment on special teams? Spurrier: Adam (Yates) pooped around on a couple of kickoffs, but besides that he and Tyler (Hull) kicked it ok I guess. Our entire return game has been poopin’ around the last few weeks, I don’t know what’s going on there. That’s one area where I thought our poopin’ days were over, but we just don’t seem to ever turn that poopin’ corner on special teams. Gman: How about the crowd Saturday? Spurrier: Not as much poopin’ around by the student section as usual, ‘specially for a noon game. I thought they did a decent job. Folks in the east upper were poopin’ around from the beginning, but I can’t blame them, looked hot up there. I’d probably poop around by the beginning of the fourth myself since all our offense was doing was poopin’ around. Gman: Coach, have you heard from Stephen Garcia lately? Gman: Okay, that’ll wrap up our first installment of Poopin’ Around with Steve Spurrier, thanks coach!